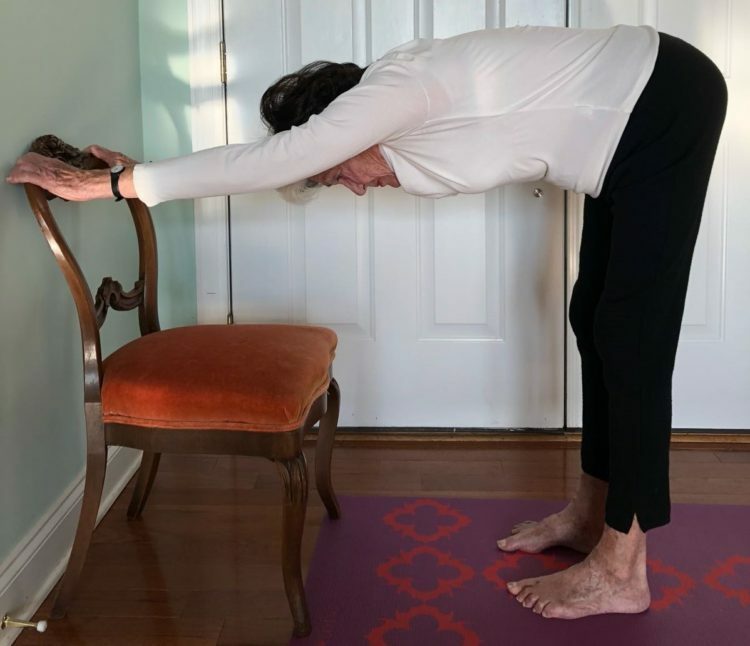 Elderly people respond to yoga so wonderfully. Their bodies remember flexibility and movements they had in younger age. Fex a swimmer will stay flexible in the shoulders and a dancer in the hips. I can witness elderly progress tremendously fast. Range of movements are often not practiced and forgotten. When introduced again, even at a later stage in life the body consciousness will remember and go for it. When S. started doing yoga, she wasn’t able to bend her knees, because she was in so much pain. We worked on lifting the kneecaps in poses where the knees need to be kept straight, like dandasana, uttanasana, trikonasana, and prasarita padottanasana. This strengthened the ligaments in her knees, and as you can see, standing on one leg in ardha chandrasana is no big deal for her.